Jesus is the one portrayed by John here and also in Rev.19:12 (Jesus strikes the nations with the sword that comes from his mouth). This is judgment. Commendation: Jesus knows what goes on in his church. “I know where you live (Where Satan has his throne.) Jesus called Pergamum the city of Satan. A follower of Jesus had been put to death here already. This city was very much anti-God or anti-Jesus. Persecution was rampant. -They remained faithful in spite of the persecution. People in the church of Pergamum were trying to corrupt the rest of the church to engage in idolatry (eating food sacrificed to idols, and engage in sexual immoralities which took place in the temples of these idols). (v.15) Those who held to the teaching of the Nicholaitans (a group who didn’t have a problem mixing Christianity with pagan practices. Syncretism: the combination of different forms of belief or practice. This menace was in the church already and Jesus was not very happy about this. HE who has an ear let him hear what the Spirit says to the churches. To him who overcomes, I will give some of the hidden manna. I will also give him a white stone with a new name written on it. Known only to him who receives it. -the hidden manna – Manna was the food God provided for Israel in the desert. It represented God’s provision. Jesus is saying if you overcome and don’t compromise, but remain faithful to me, I will give you real food to eat, not like the food sacrificed to idols. Jesus wants his church to be faithful in the midst of persecution, even when we may live in the town where Satan is in charge, Jesus expects you to be faithful to him. You may work where Satan is the boss, the Jesus expects you to be his faithful witness. Jesus doesn’t want a syncretistic church: married to him and also to the world. 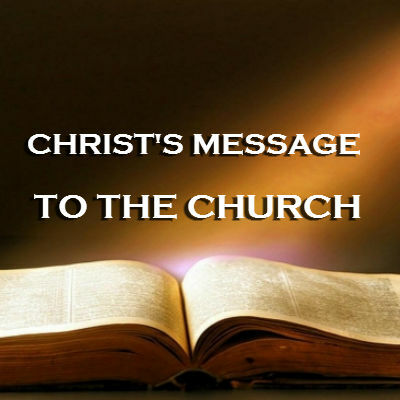 His church needs to be faithful to Christ. There will be lots of obstacles and things to overcome before finish this race. . Jesus expects his church to overcome the world and not be molded by the world’s ideologies. It is after we have triumphed in this world as his church that Jesus will reward our faithfulness. -Only the overcomers get rewarded at the end.